Our neighbors, mom and dad of Molly's squad, hosted a Fauxgiving/Friendsgiving dinner yesterday and I was crazy excited because I had a beautiful dream to ditch the Evans family's traditional sweet potatoes recipe. This would, of course, not fly for our Thanksgiving meal, but with a bunch of hippies, I felt totally empowered to make a casserole topped with granola. 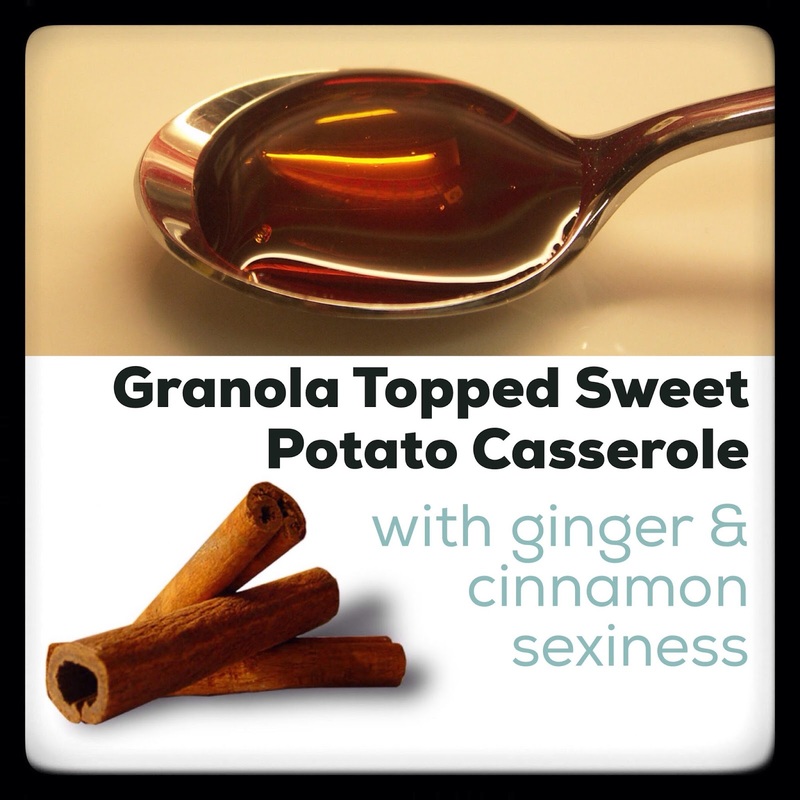 I used flavors I use in my granola in the potatoes as well. The company was as incredible as the food, and we all had a fantastic time. I laughed until I needed my inhaler. But anyway: Let's get this recipe into the world! Be very free with this. I'll go a little bit sweeter on the actual potatoes next time, and nutmeg or cloves or pumpkin pie spice would be amazing. And any nuts you like would work. Mash cooked sweet potatoes with butter, beat with electric mixer until smooth. Beat in eggs, one at a time until well combined. Add sugars, honey and molasses, vanilla, and dry spices to taste and mix until combined. Spoon mixture into a 10X10 cake pan, 9X12 casserole dish or similar bakeware. Rub dry ingredients into butter and molasses until crumbly and sprinkle liberally over top of casserole. Bake for 60 minutes. After 40 minutes, begin checking for crispness of topping. When topping is crunchy, top with aluminum foil and continue to bake for rest of hour. I haven't forgotten I promised on Twitter and Facebook to write up my take on the ACLU meeting last week, but that's going to be a four year plan. You might want to make a Hippie Casserole this week, so I thought I'd pop this online first.